I cherry-pick the films I review on the site, which goes a long way to explain why I rarely give low ratings (plus, through my ‘weekends of trash’, I’ve seen some genuinely bad films so realise that something with a few niggles that gets the masses up in arms is actually still a pretty good effort). However, I occasionally opt to cover films I almost expect not to like or at least feel there’s a good chance I won’t. I’m referring to the list of films I feel I should watch but possibly don’t want to watch. These are often titles that are well respected by critics, but look to be of a type I’m not too keen on. These are typically films more heavily focussed on ponderous conversations about philosophy than any semblance of a captivating story, or those with an aim to ‘make a statement’ rather than provide the slightest glimmer of entertainment. Don’t get me wrong, I watch and love a lot of high-brow cinema, but certain approaches rub me up the wrong way. Goddard for instance is a director I rarely warm to, as are a few other European art-house heavyweights such as Buñuel. One film that fits this bill is Last Year at Marienbad. Its critical reputation is exemplary, but equally among audiences it’s notorious for being a very tough and baffling watch that is nigh-on impossible to decipher. I’ve long felt I should give it a try, but kept putting it off, worrying it’d be a terrible bore. However, when Studiocanal offered me a copy of this new Blu-Ray of the film to review I felt now was the time. I found a free afternoon, settled in and prepared for the worst, but hoped for the best. On the surface at least, Last Year at Marienbad is about a man (Giorgio Albertazzi) who meets a woman (Delphine Seyrig) at a strange, old fashioned hotel. He tells her he has seen her before, last year at Friedrichsbad or maybe Marienbad, but she doesn’t believe so. He’s adamant about it though and endlessly follows her, trying to convince her of this fact. As the film goes on, nobody (including the audience) really know who or what to believe as we’re trapped in a whirlpool of memory fragments and obscure theories. 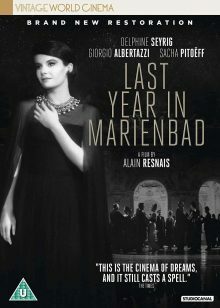 After finally entering the world of Last Year at Marienbad I’m not sure what I felt about it. It was equally as good and as bad as I’d hoped and predicted. I’ll start with what I didn’t like about it. My main problem was that it was as tough to watch as I expected. It’s quite a short film in terms of length, but I struggled to stay focused and had to pause it for a break once or twice. The issue is largely how repetitive it is. The brief synopsis I described above is pretty much all there is to the surface narrative of the film. All we are presented with is an endless debate between the man and the woman over whether or not they met and what is supposed to have happened a year ago, and that isn’t much to hold your interest for an hour and a half. Equally as maddening is the unusual organ music which pervades the film. It’s very effective in creating what I believe was the intended feeling of being trapped in a vortex, but it’s infuriating to listen to for 90 minutes. However, as exasperating as I often found the film, I could still appreciate why it’s so highly regarded. I also found myself caught in its grip from time to time (before getting lost again). There’s a scene where the man and woman discuss a statue in the hotel grounds and state how certain details don’t matter and it can mean whatever you like it to mean. This seems to be a clear description of director Alain Resnais and writer Alain Robbe-Grillet’s intentions behind the film. It’s open to endless interpretations and although that can be a turn-off for those looking for something clear cut to inform or entertain, it provides a work of art that can be discussed forever, much like the central discussion between its two protagonists. There’s an excellent featurette on the disc that offers a few readings of the film and I thoroughly recommend viewers give it a watch. One idea considers similarities between Marienbad and The Shining and I can see that. Resnais’ film did have a horror movie feel to its sensation of being trapped. The easiest aspect of the film to appreciate though is its style. The film is staggeringly beautiful to look at. The cinematography is gorgeous, combining moodily lit interiors with bright, high contrast exteriors and utilising a near-continuously moving camera that floats around the hotel like a ghost. The costumes (designed by Chanel) and production design are exquisite too. Even if you can’t find anything within the content or subtext to hold your interest during the film, you can sit back and appreciate how gorgeous it looks. I also admired the way Resnais played with the audience’s minds through disorientating cinematic techniques. The film regularly jumps between the present day and flashbacks/memories/dreams, but by cutting between these using continuity editing, matching character positions and having dialogue overlap between the various dimensions, it’s not always clear where we are. This all adds to the film’s dreamlike or nightmarish atmosphere and is evidence of why the film is regarded as such a cinematic masterpiece. I don’t feel I can give Last Year at Marienbad a straightforward score out of 5 here as I was so torn by my feelings on the film. It’s frustrating, repetitive and dare I say it, boring, yet equally it’s hypnotic, fascinating and masterfully constructed. It’s undeniably stunning to look at, that’s for sure, but it’s so cryptic and impenetrable it’s hard to easily enjoy or recommend. It’s something that should be experienced though and those inclined to this type of cinema simply must watch the film. Last Year at Marienbad is out on 17th September on Blu Ray and DVD in the UK, released by Studiocanal. I saw the Blu-Ray version and the film looks and sounds great. These are wonderful and essential viewing to better appreciate Resnais and Robbe-Grillet’s intentions in making the film, as well as to offer a number of interesting interpretations of it.